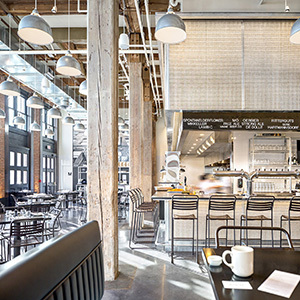 B&G Oysters | Bentel & Bentel Architects/Planners A.I.A. B&G OYSTERS, BOSTON, MA - Located in Boston’s South End, tiny B&G Oysters is our response to Chef Barbara Lynch’s desire to create a modern translation of a classic oyster bar. The design, a syncopated arrangement of bleached wood panels, honed marble counters, and oyster-colored glass tiles, has a contemporary neighborhood feel in which friendly service, fresh oysters from both coasts, seasonal seafood dishes, New England classics including the celebrated lobster roll, and a seafood-friendly wine list infuse the restaurant with an invigorating sophistication.